SAN FRANCISCO, Calif. - Nov. 27, 2018 - Salesforce (NYSE: CRM), the global leader in CRM, today announced results for its fiscal third quarter ended October 31, 2018. "I'm thrilled that Salesforce will be the fastest enterprise software company in history to reach $16 billion in revenue," said Marc Benioff, chairman and co-CEO, Salesforce. "I would like to thank all of our Ohana who make everything we do possible." Revenue: Total third quarter revenue was $3.39 billion, an increase of 26% year-over-year, and 26% in constant currency. Subscription and support revenues were $3.17 billion, an increase of 26% year-over-year. Professional services and other revenues were $224 million, an increase of 15% year-over-year. Earnings per Share: Third quarter GAAP diluted earnings per share was $0.13, and non-GAAP diluted earnings per share was $0.61. Mark-to-market accounting of the company’s strategic investments, required by ASU 2016-01, benefited GAAP diluted earnings per share by $0.07 and non-GAAP diluted earnings per share by $0.06. Cash: Cash generated from operations for the third quarter was $143 million, an increase of 14% year-over-year. Total cash, cash equivalents and marketable securities ended the third quarter at $3.45 billion. Unearned Revenue: Unearned revenue on the balance sheet as of October 31, 2018 was $5.38 billion, an increase of 25% year-over-year, and 26% in constant currency. Remaining Performance Obligation: Remaining performance obligation, representing future revenues that are under contract but have not yet been recognized, ended the third quarter at approximately $21.2 billion, an increase of 34% year-over-year. This includes approximately $300 million related to the remaining performance obligation from MuleSoft. Current remaining performance obligation, which represents the future revenues under contract expected to be recognized over the next 12 months, ended the third quarter at approximately $10.0 billion, an increase of 27% year-over-year. As of November 27, 2018, the company is initiating revenue, earnings per share, and unearned revenue guidance for its fourth quarter of fiscal year 2019. The company is also raising its revenue guidance and earnings per share guidance, and maintaining its operating cash flow growth guidance for its full fiscal year 2019, previously provided on August 29, 2018. In addition, the company is initiating revenue guidance for its full fiscal year 2020. The guidance below does not reflect any potential future gains or losses on our strategic investment portfolio resulting from the impact of ASU 2016-01. While historically our investment portfolio has had a positive impact on our financial results, that may not be true for future periods, particularly in periods of significant market fluctuations that affect the publicly traded companies within our strategic investment portfolio. The guidance below is based on estimated GAAP tax rates that reflect the company’s currently available information, including the anticipated impact of the new Tax Act and interpretations thereof, as well as other factors and assumptions. The GAAP tax rates may fluctuate due to recent acquisitions. * The company's GAAP tax provision is expected to be approximately 13.0 percent for the three months ended January 31, 2019 and 1.2 percent for the year ended January 31, 2019. The GAAP tax rates may fluctuate due to recent acquisitions or other transactions. 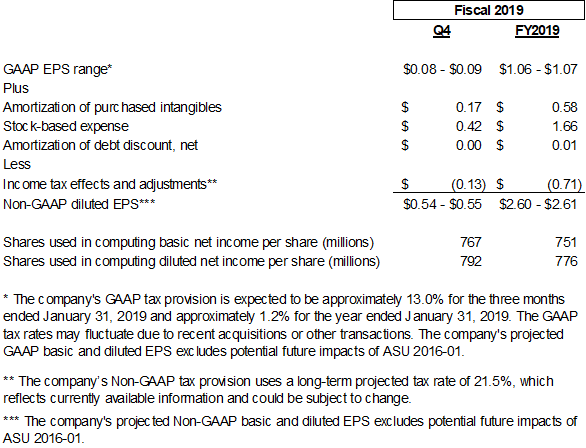 The company's projected GAAP basic and diluted EPS excludes potential future impacts of ASU 2016-01. ** The company's non-GAAP tax provision uses a long-term projected tax rate of 21.5 percent, which reflects currently available information and could be subject to change. *** The company's projected non-GAAP basic and diluted EPS excludes potential future impacts of ASU 2016-01. Salesforce will host a conference call at 2:00 p.m. (PT) / 5:00 p.m. (ET) today to discuss its financial results with the investment community. A live web broadcast of the event will be available on the Salesforce Investor Relations website at www.salesforce.com/investor. A live dial-in is available domestically at 866-901-SFDC or 866-901-7332 and internationally at 706-902-1764, passcode 7068467. A replay will be available at (800) 585-8367 or (855) 859-2056 until midnight (ET) December 26, 2018. "Safe harbor" statement under the Private Securities Litigation Reform Act of 1995: This press release contains forward-looking statements about our financial results, which may include expected GAAP and non-GAAP financial and other operating and non-operating results, including revenue, net income, diluted earnings per share, operating cash flow growth, operating margin improvement, unearned revenue growth, expected revenue growth, expected tax rates, stock-based compensation expenses, amortization of purchased intangibles, amortization of debt discount and shares outstanding. The achievement or success of the matters covered by such forward-looking statements involves risks, uncertainties and assumptions. If any such risks or uncertainties materialize or if any of the assumptions prove incorrect, the company’s results could differ materially from the results expressed or implied by the forward-looking statements we make. The risks and uncertainties referred to above include -- but are not limited to -- risks associated with the effect of general economic and market conditions; the impact of foreign currency exchange rate and interest rate fluctuations on our results; our business strategy and our plan to build our business, including our strategy to be the leading provider of enterprise cloud computing applications and platforms; the pace of change and innovation in enterprise cloud computing services; the competitive nature of the market in which we participate; our international expansion strategy; our service performance and security, including the resources and costs required to prevent, detect and remediate potential security breaches; the expenses associated with new data centers and third-party infrastructure providers; additional data center capacity; real estate and office facilities space; our operating results and cash flows; new services and product features; our strategy of acquiring or making investments in complementary businesses, joint ventures, services, technologies and intellectual property rights; the performance and fair value of our investments in complementary businesses through our strategic investment portfolio; our ability to realize the benefits from strategic partnerships and investments; our ability to successfully integrate acquired businesses and technologies, including the operations of MuleSoft, Inc.; our ability to continue to grow and maintain unearned revenue and remaining performance obligation; our ability to protect our intellectual property rights; our ability to develop our brands; our reliance on third-party hardware, software and platform providers; our dependency on the development and maintenance of the infrastructure of the Internet; the effect of evolving domestic and foreign government regulations, including those related to the provision of services on the Internet, those related to accessing the Internet, and those addressing data privacy and import and export controls; the valuation of our deferred tax assets; the potential availability of additional tax assets in the future; the impact of new accounting pronouncements and tax laws, including the U.S. Tax Cuts and Jobs Act, and interpretations thereof; uncertainties affecting our ability to estimate our non-GAAP tax rate; the impact of future gains or losses from our strategic investment portfolio, including gains or losses from overall market conditions which may affect the publicly traded companies within our strategic investment portfolio; the impact of expensing stock options and other equity awards; the sufficiency of our capital resources; factors related to our outstanding debt, revolving credit facility, term loans and loan associated with 50 Fremont; compliance with our debt covenants and capital lease obligations; current and potential litigation involving us; and the impact of climate change.